Krishna Engineering Works is a company engaged in manufacturing, exporting and supplying of Flexible Packaging, Paper, Tire–Cord, Textile Machinery & Equipments.We manufacture machines like, Liner Rewinder Machine, abric – Re – Rolling Machine, High Efficiency Inspection Machine, Linear Drying Machine, Material Handling System, Automatic Guiding System, Cooling And Heating Drums, Automatic Festoon Accumulator, Core Cutting Machine, Hydro Pneumo Web Aligner System etc. from Ahmedabad, Gujarat, India. We have been successfully manufacturing all types of above Converting machinery since last 25 years from Ahmedabad, Gujarat, India. 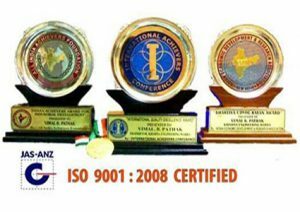 We are winner of 3 times National Award and 2 times International Award for Quality manufacturing. For Slitter Rewinder Machine, we have processed all types of material like LD, PVC, Paper, Film, Cloth, Nylon, etc. We have more than 1400 installation of Slitting Rewinding Machine in India and overseas like Saudi Arabia, UAE, Dubai, Sharjah, South Africa, Nigeria, Ghana, Congo, Kenya, Zambia, Sri Lanka, Bangladesh, Malaysia, Pakistan, Nepal, Russia, Thailand, Indonesia, Brazil, Colombia, Venezuela, Argentina, Mexico, Canada, etc. Hydro–Pneumo Web Aligner System is being exported all over the world. Our Web Guiding System is renowned for its super fine accuracy. Continuous interaction with our customers & personal good relations with them is our work policy. 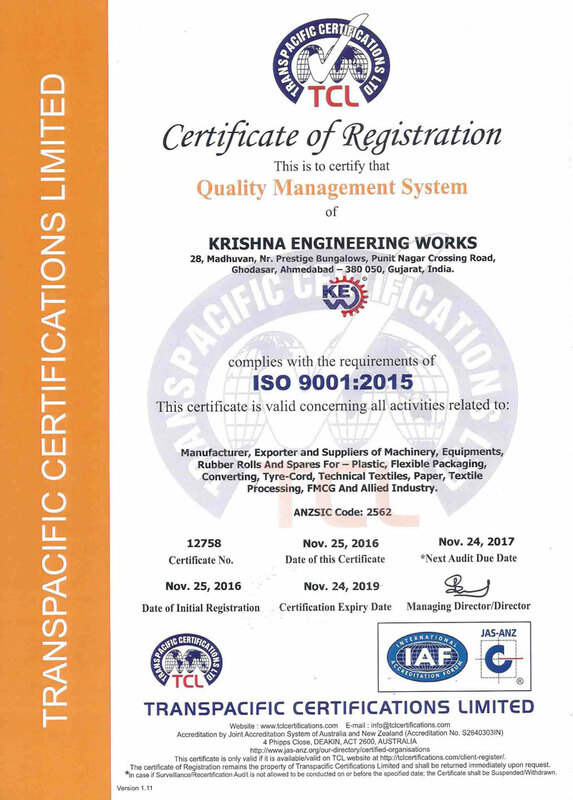 Krishna Engineering Works is a company incorporated by experts having vast experience of 25 years in the Engineering industries of Textile Processing and Tyre – Cord machineries. Our founders have a deep technical & marketing knowledge in these industries. The company takes regular participation in national, international conference, exhibitions, etc. to continuously update itself with latest technological advances and make available to the market our latest products.